Bielefeld, October 11, 2016: LaVison BioTec, developers of advanced microscopy solutions for the life sciences, report on the latest work of Nicolas Renier, a Post-Doctoral Fellow in the laboratory of Marc Tessier-Lavigne at the Rockefeller University in New York where he applies light sheet microscopy to measure activity in a mouse brain from a single snapshot. The work has been published online in Cell.1 Entitled “Mapping of brain activity by automated volume analysis of immediate early genes,” the paper introduces a new methodology called ClearMap, a pipeline for automated activity mapping in intact samples. This goes through a number of steps: the high-speed acquisition of brain activity at cellular resolution through profiling immediate early gene expression using immunostaining and light-sheet fluorescence imaging, followed by automated mapping and analysis of activity by an open-source software program (ClearMap). We wanted to develop a technique that would show you the level of activity at the precision of a single neuron, but at the scale of the whole brain. In our method, we validate the pipeline first by analysis of brain regions activated in response to haloperidol. Next, we report new cortical regions downstream of whisker-evoked sensory processing during active exploration. Last, we combine activity mapping with axon tracing to uncover new brain regions differentially activated during parenting behavior. This pipeline is widely applicable to different experimental paradigms, including animal species for which transgenic activity reporters are not readily available. The technique also has broader implications than simply looking at what areas of the mouse brain are active in different situations, he adds. It could be used to map brain activity in response to any biological change, such as the spread of a drug or disease, or even to explore how the brain makes decisions. 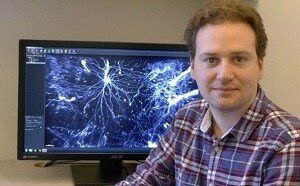 “You can use the same strategy to map anything you want in the mouse brain,” says Renier. For light sheet imaging, the group has chosen the LaVision BioTec UltraMicroscope providing high speed and large fields of view. In neuroanatomy, users mostly want to look at large regions, up to 1 cm wide. Combining this with the need to image a large number of samples to get statistical significance, a very high acquisition speed is required. To date, the researchers feel that the UltraMicroscope is the only microscope on the market that can perform to their stringent requirements. In comparison to confocal microscopy where bleaching is an issue, light sheet microscopy is 20 x faster. The UltraMicroscope is the only commercial light sheet microscope that allows the handling of organic solvents. We are now using the iDISCO2 technique routinely in the lab for most of our projects. This preserves morphology and size of cleared samples for automated registration. The technique has upgraded most of our histology assays and we now rarely section tissues anymore. We use the technique to study the trajectory of nerves in whole embryos, to count cell number in whole organs, to trace single axons in the brain. We also have further work being published soon about the mapping of features of neurodegenerative disorders in mouse and human brains using light sheet microscopy and iDISCO. To receive more details about LaVision BioTec’s TriM Scope 2-photon Microscope II and the UltraMicroscope II, please contact LaVision BioTec on +49 (0)5219151390, visit the web site: www.lavisionbiotec.com.